There are within our local authority, young people who take on a caring role for either their parents or siblings.As professionals working with families across the city, it is important that you recognise this and raise awareness as what support is available, to both the family and the young person. Young Carers can often be late for school or have a low attendance, they may often be tired or withdrawn, isolated or a victim of bullying. A Young Carer could have difficulties completing homework, or achieving their academic potential. If you are in contact with a Young Carer who is reluctant to engage in support, or who feels their family may not agree to it, contact the Early Help Support Team to talk this through. 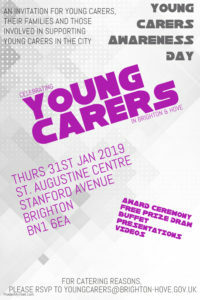 There is a Young Carers Awareness Day on the 31st January 2019.